When the average person hears the word “theater,” what usually comes to mind is a big stage with red curtains and bright lights. Audience members sit and watch, maybe even laugh or cry, but to most people, theater is a spectator sport. But at Gordon College’s first ever Mini-fringe Festival, theater became an immersive experience. Instead of the single spring play usually performed by the Theatre Department, six different shorter pieces premiered in Barrington earlier this month; each featured a new, experimental type of theater that invited the audience into the story. When viewers of Two Points off the Weather Bow (pictured above) walked into the black box theater, they were surprised to find no seats; boxes, crates, ropes and other items formed the deck of a ship. Audience members stood and wandered around as the actors told the story of a whaling voyage. The cast treated the audience as a part of the “crew,” asking them to coil ropes, swab the deck, participate in a trial, sing sea shanties and make bids for an auction. The climax of the story was a whale hunt, where the audience members pretended to be on life boats, using their arms to mimic rowing and throwing harpoons at a whale in the water. 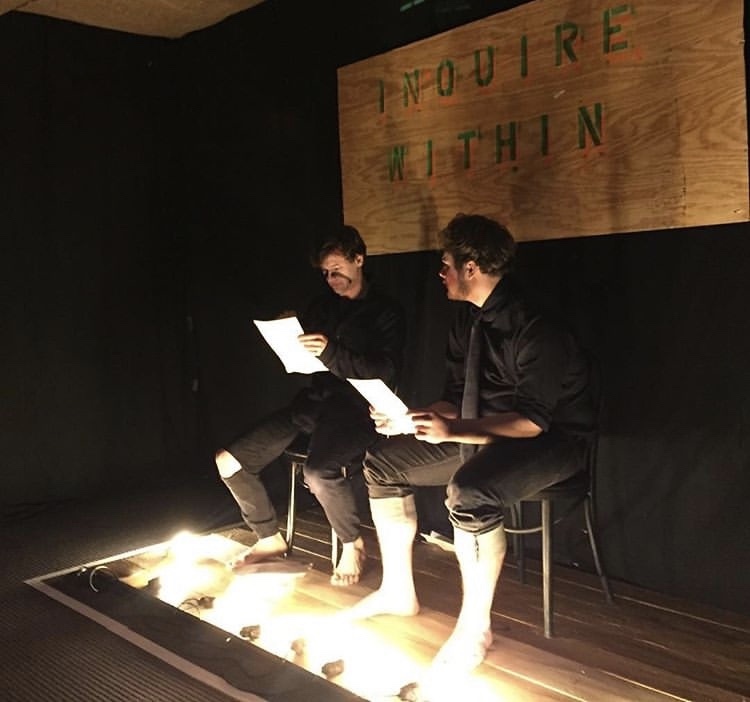 This immersive piece was written and directed by theater major Jonathan Wacker ’19 as part of his senior seminar project. “Two Points was designed to lean into what I believe the strengths of theater are: action and community,” he said. This Is Not A Bill, written by Alexia Rowe ’20 and directed by Kristina Wacome-Stevick, started in a small hallway. This show is a pilot piece for History Alive, an immersive theater company that uses storytelling to inform tourists of important historical events that happened in Salem. The play tells the story of Patty and Phillip, two runaway slaves from a Virginian plantation, who seek refuge in Salem through the underground railroad. 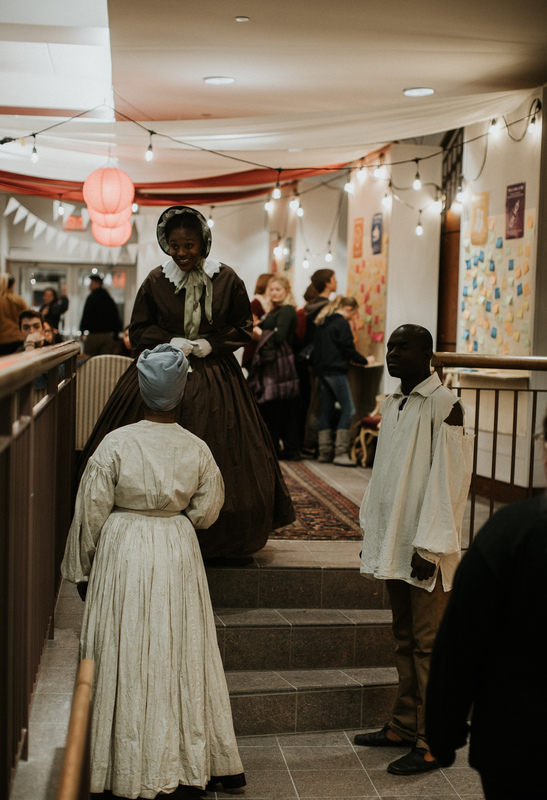 The actors treated the audience members as fellow slaves, guiding them through the hallways of Barrington as they explained the opportunities Salem offered, such as marriage and education, but also the dangers, due to the Fugitive Slave Act that allowed masters to take back escaped slaves. Inquire Within wasn’t rehearsed or staged. In a dark room with a string of lights, a pair of actors dressed in black asked and answered questions. The catch? The person asking questions could ask any question they wanted, but could only ask questions. The person answering could only answer as themselves, not as any character, and they couldn’t refuse the question, no matter how personal. The askers had a sheet of questions, from the simple “What’s your favorite food?” to “What would you change about yourself?” The show was ongoing throughout each night of the festival, with the actors rotating every half hour. “There was something strangely human and profound about it,” says Edward Lindem ’19 after watching the piece. The other plays were Pulled Under, The Carpool Plays, and I, Malvolio.